The Christmas festive period is upon us, which means that suddenly people appear from everywhere and clutter the shops, roads malls and town centres, making even a simple errand 10 times more difficult and time consuming. It is easy being “tortoise-minded” and embrace the slow philosophy, psychology and lifestyle if you stay out of the way and live like a hermit. 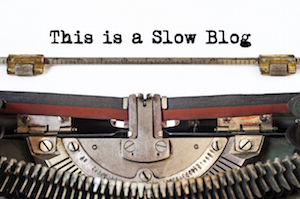 But that isn’t really what Slow is about, if you cannot be slow in a hectic environment then you are not really being “Slow” you are just avoiding. So, how can you remain calm centred and unflustered in a hectic, busy and chaotic environment? Try this simple, on the fly mediation that you can do anywhere at any time (just try not to get in anyone’s way, you have to stand still for about 30 seconds!). Centre yourself in your body, sink into your hips, lengthen your spine and stand up straight (imagine you are being pulled up by a thread attached to the crown of your head), focus on your breathing and make the conscious effort to relax on the out breath. This step only needs to take five seconds. Now imagine you are watching yourself out of the top of your head (so you are looking down on yourself, go as high as you need to get the right perspective), see yourself as the centre of the storm of people around you. You are still, grounded and calm, everyone else is spinning round you at high speed, hectic and flustered. Once you have spent a few moments doing that (you can do it with your eyes open or closed, depends on the situation), come back into your body, re-centre and focus on the sense of serene calm that you have created. Look around and allow yourself to smile at the throng of people around you. Repeat the mantra (in your head) “I am the calm centre of the storm raging around me” (or something similar). Now when you start moving through the crowd, rather than getting sucked into the melee, you are the calm centre and that storm is rage around you. With a bit of practice you will be able to hold this state for as long as you need, and the odd thing I have found is, when I am in the push and shove of the crowd, if I remain in the calm centred state, people seem to move out of my way! I wish you all the best in remaining calm and unflustered in this hectic season!